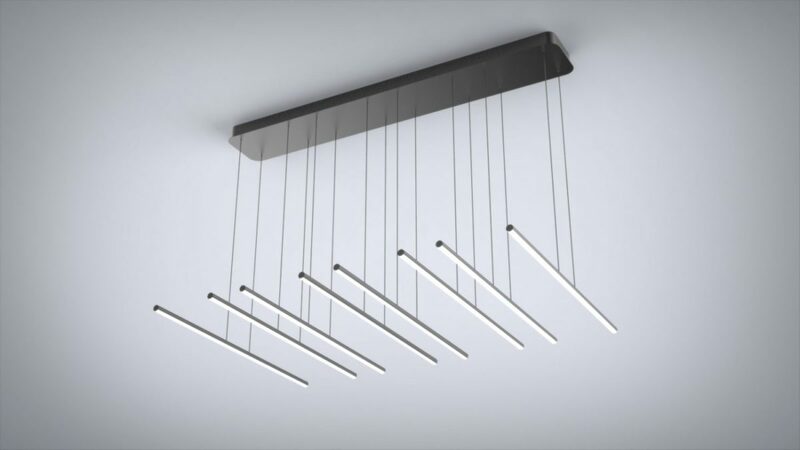 This modern light comes with eight parallel light sources with adjustable suspension wire making it easy to create cool patterns and customizing your fixture. Each stick is 25.6 inches in length, while the fixture is 47 inches long. The light diffuser is made of high quality silica and the fixture frame is high grade aluminum. With 100 watts of 50,000 hour rated LED, this fixture shines at 9,000 lumens, making it powerful enough for any large room or table. Make sure to consider getting the dimming version of this fixture, as it’s quite bright! This fixture comes in a matte black finish with other finishes available for wholesale orders. All of our lights are able to ship worldwide by request with universal voltages – just shoot us a message to get a quote. Keep in mind this light fixture is built to order, lead time can be 3-4 weeks.